Third-year students in Conestoga’s Bachelor of Public Relations (PR) program welcomed the college community to the Idea Exchange at the Old Post Office in Cambridge on April 9 for an end-of-semester showcase, displaying work created as agency consultants. Third-year students in Conestoga’s Bachelor of Public Relations program displayed work created as agency consultants at an end-of-semester showcase. 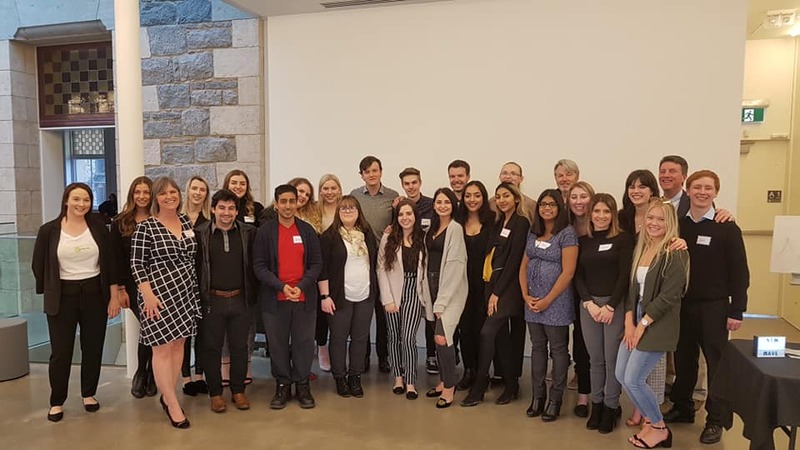 The showcase was a culminating component of a new approach to the program’s Public Relations Consulting course, where students worked in a simulated PR agency environment to create pieces to support Conestoga Applied Research and Innovation (CARI). Students worked out of the college’s applied research facility in Cambridge’s Gaslight District to form their own micro-agencies, each assigned to one of the college’s centres of innovation. Barrett acted as creative director and two students on field placement from Conestoga’s Advertising and Marketing Communications program were brought on board as graphic designers. PR students drove the process, which included assessing client needs, creating and presenting proposals, and working with designers to develop fresh and unique ideas. For Barrett, partnering with CARI was a critical component of the project, exposing students to research and a rapidly growing area at the college that could offer diverse consulting challenges. Conestoga is ranked among Canada’s top 25 research colleges, supporting the needs of industry and community partners while providing students with opportunities to build real-world skills. During 2017-18, approximately 2,100 students and more than 170 faculty members at Conestoga were engaged in applied research projects. Conestoga's Bachelor of Public Relations degree program was the first to be approved in Ontario and the fourth of its kind in Canada. Graduates are prepared with critical thinking skills and the practical experience required to manage reputations, responses and relationships on behalf of their organization.